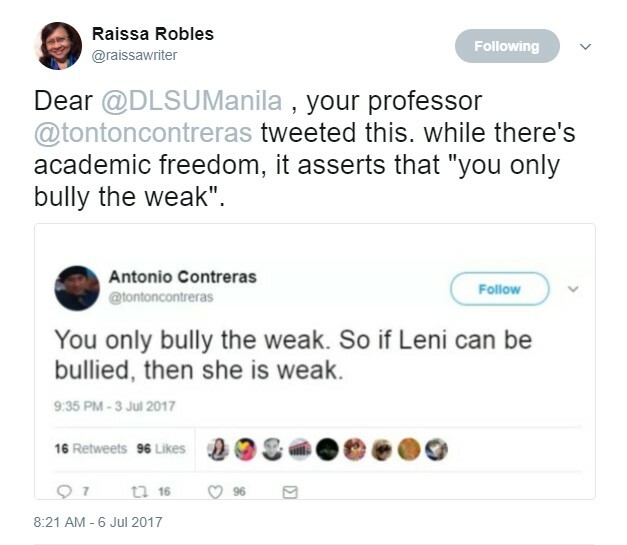 One of the Dilawan nation's biggest troll Raissa Robles hit DLSU Professor Antonio Contreras after tweeting this. That's the cue for the dilawan zombies to make Prof. Contreras as their next target. As expected, the Professor was hit by a barrage of zealous and angry yellow zombies for criticizing their equally lame Panginoon Leni Robredo. Of course, Pro Duterte groups came to defend Professor Contreras. Here's a post from a prominent social media personality, Krizette Laureta Chu. Ok lang kayo, you want Antonio P. Contreras out of DLSU because of his anti Leni stance? And because some stupid biased journalist can't distinguish between an imperative and a declarative sentence? As if. Why don't you take a long hard look at what your compatriot Jesus Falcis has written and asked him to be kicked out by whatever school he teaches at? How many times has that blockhead insinuated things he cannot prove, like Duterte's illnesses? And he's a goddamn lawyer who is supposed to know and respect veritable and verifiable facts. Falcis even liberally borrowed the picture of Ethel Pineda when we were in Malacanang and said nandoon kami because of our own personal motives! That was a personal insult for private citizen/supporters--we were not even government employees so he could have the freedom to criticize us. He didn't even know our names. He didn't even know who the people there were, basta ipost agad at insultuhin agad. And did we call out for his school to punish him for defamation? Contreras is a political scientist and it falls squarely in his field of study to do political commentaries, whether you like them or not. Double standards much, hypocrites? Mga hunghang. Ang mag sa sign Lasallian? Pakilagay ID number. I know for a fact Lasallians aren't stupid elitists. I know because I am a Lasallian and our professors and the school have always respected diversity. Hindi kami tinuruan to think like sheep. Students can think for themselves. And it would have been a great privilege to me if somebody like Contreras was one of my professors. I would have loved the lively discussion and the debates in the class! He would have made me think harder. If I disagreed with him, I would have been motivated to study harder so I can appropriately counter. If I agreed with him then he would have added to my conviction. Kelan pa naging mali magkaroon ng political scientist na anti anything? My dad was a working student of Law at the Ateneo while he was teaching Political Science at FEU. He was a solid Marcos supporter during the Cory years. And it made his classroom lively. This post originally appeared on Krizette Laureta Chu's Facebook page.